14 tracks, a total playing time of 36 minutes, must be an album from 1965, right? Nope, not at all. “Shake Some Action” was released in 1976, it crept through a crack in the wall of a contemporary music business that was dominated by disco and the bombastic cleverness of bands like Emerson, Lake & Hitler. Flamin’ Groovies sounded delightfully liberating and offered a breath of fresh air. They were not alone. The Ramones’ first album was out, Dr. Feelgood had already released two. Rock was reinventing itself and taking it to the streets and the clubs and the pubs. But Flamin’ Groovies had actually been around for a long time. Their first album (“Supersnazz”) was released back in 1969. While rock transformed into excessively long songs about nothing much at all, Flamin’ Groovies kept it simple and short. They were much more of a garage band at the time, Stones-like on a low budget. But there were also signs of a lighter approach in their more melodic tracks. 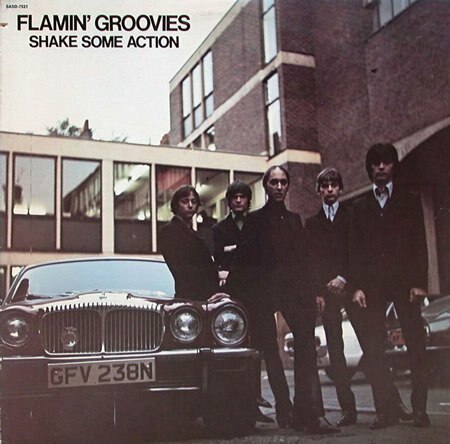 Flamin’ Groovies invented power pop, that’s what they did. There were not enough people around to appreciate what they were doing, however, their style was too easily dismissed as old fashioned when in fact it was timeless. Their momentum finally came in ’76. After a five year break they returned with “Shake Some Action”, produced by Dave Edmunds, an old fan, and Greg Shaw, and recorded in Edmunds’ Rockfield studio in Wales. Less Stones this time and much more pop. Wistful melodies served in a crisp shower of guitars. The style owed a lot to the Byrds and the Searchers – and Merseybeat in general, only harder and tighter – though admittedly less distinctive. The album sounded amazingly fresh in 1976, and it hasn’t lost any of its charm 38 years on. The Norwegian rock band Margarets sometimes sounded like a cousin to the Flamin’ Groovies. And that is definitely meant as praise. Check both of them out.